The Container Terminal Adriatic Gate is located in the Sušak basin, and it started operating in 1977. At that time, the first container crane in the Port of Rijeka was set up in this first phase of construction. Subsequently, in 1987, the south pier in a length of 300 meters was built with a depth of 11,2 meters. In 2013, after the implementation of the Rijeka Gateway Project at the container terminal, the second phase of terminal construction was completed, namely the extension of pier by another berth and the corresponding increase of the storage areas and the construction of the entry/exit point. At the end of the works worth 30 million EUR, sea depth increased to a minimum of 14,2 meters which enabled the servicing of container ships of up to 370 meters long, reaching the maximum capacity of 600 000 TEU. The installation of a temporary mooring buoy and the construction of the entry/exit point and the Border Inspection Point (BIP) followed. After the implementation of the expansion works under the Rijeka Gateway Project, the concessionary company Jadranska vrata d.d. 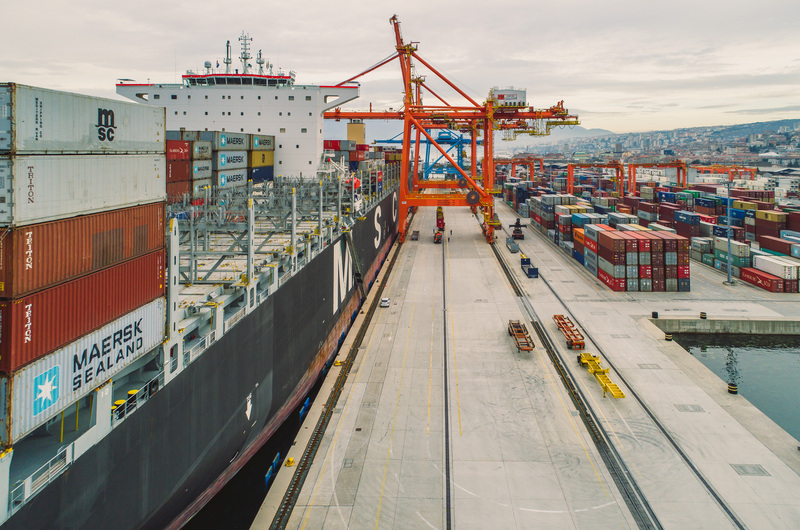 installed new pier and storage equipment worth 23 million EUR, namely two high-capacity Panamax cranes, 6 container gantry cranes and 2 container rail-mounted gantry cranes. In addition to the large investments in the implementation of the Rijeka Gateway Project, significant funds have been approved for the implementation of the European project from the Connecting Europe Facility (CEF). 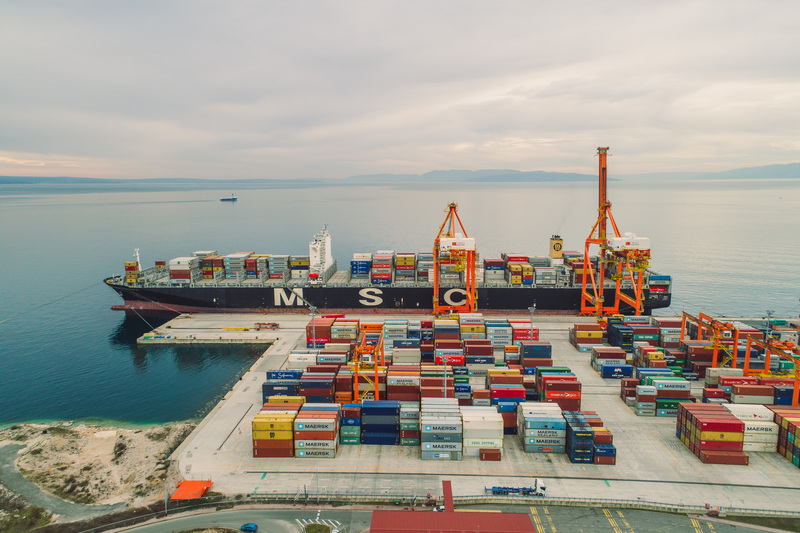 The project called Multimodal Platform Development at the Port of Rijeka and connection with the Adriatic Gate Container Terminal (POR2CORE-AGCT) worth 35,556,000 EUR will improve the intermodal terminal by reconstructing the existing Rijeka-Brajdica marshalling yard and extending the existing tunnel by 400 meters for the purposes of construction of the pull-out track, which will significantly increase the share of railways in the transport of containers by December 2020. 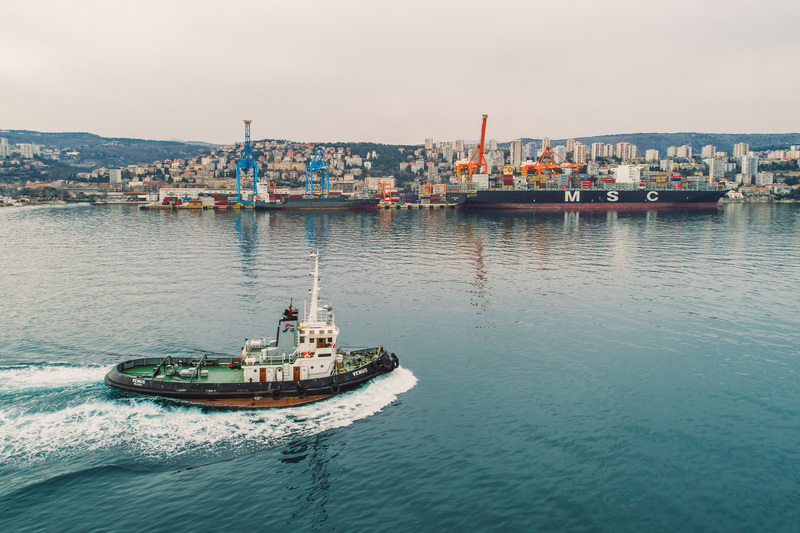 In 2018, the project Improvement of the Infrastructure of the Port of Rijeka– AGCT dredging (POR2CORE-AGCT dredging) was approved. This project worth 13,9 million EUR will also be funded from the CEF programme, in partnership with the concessionaire of the terminal, Adriatic Gate j.s.c. The funds will finance terminal adaptation in order to increase capacities and the possibility to accommodate larger vessels. At the Container Terminal Adriatic Gate, located on Brajdica, company Adriatic Gate Container Terminal (AGCT/ICTSI) provides services primarily related to the transhipment and storage of containers, as well as additional services such as Container Freight Station – filling and emptying of containers. All the services are related to the containers and the cargo they carry. The services include: loading and unloading of containers, reception and delivering containers from/to lorries, reception and delivering containers from/to the railway, filling and emptying of containers, container washing, fumigation and assistance in customs or phyto-sanitary inspection, sealing and storage of cargo. RGP – Extension of the Container Terminal Adriatic Gate open! CEF – Connecting Europe Facility open! CEF – POR2CORE-AGCT dredging NEW! Adriatic Gate Container Terminal j.s.c. visit!